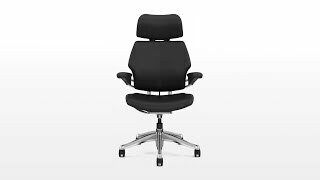 When you need a replacement cylinder, base, or footring for your Humanscale Freedom Chair, we have you covered. Our Humanscale Freedom Chair Replacement Base, Cylinder, and Footring Parts are manufactured to replace broken or worn out parts on your Freedom Chair, giving it new life with the addition of just a few components. Note: In March 2010 the taper of the cylinders was changed. As a result the new cylinders will not work with an old base. When ordering replacement cylinders for chairs built prior to March 2010, it is important to also order a replacement base. Raise or lower the height of the Freedom's seat by selecting a cylinder size. When sitting in a chair, a person's feet should rest comfortably on the floor or a foot rest. Ninety-five percent of our customers select the standard height for their chair; however, a petite user with a lower desk or a tall user with a higher desk can opt for a custom configuration without worrying about bumping their knees on a work surface. Please Note: If you aren't sure which height is best for you, give us a call and we'll help you choose. The Freedom Chair comes standard with a highly durable composite base with graphite or titanium finish, or upgrade to a powder-coated or polished aluminum base finish. Add an 18'' or 21'' footring to your extra high cylinder to make the Freedom Chair a Humanscale Freedom Drafting Chair. The footring only comes in chrome. Fantastic customer support for my chair and have been able to fix several components over the past few years. Had issues w the arms, but replacements were provided free of charge. Decided to do the pistons at the same time and ordered a piston. Unfortunately the model had changed dimensions for the base and (speaking volumes about customer service) Humanscale recognized the error and sent me the base free of charge. Could not ask for any better service! Additional kudos to Jonah (my service rep) for doing the research and generally being a great guy. Thank you for such great service. Highly recommend the chair and purchasing from this site!